Here at Slow Cooker Kitchen, we love spending finding ways to spend less time in the kitchen and more time with family and friends - without sacrificing a homemade dinner. That's why we can't get enough of the freezer bag trend. Perfectly designed for the busy household, these meals take minimal prep and deliver maximum flavor. If you don't know what it is yet, you're in for a treat. 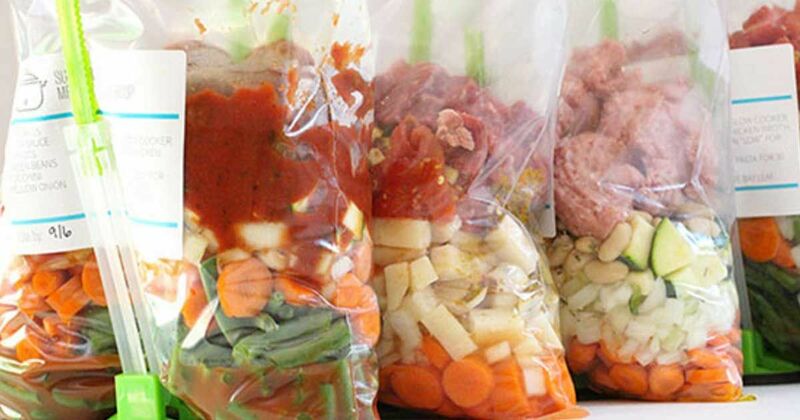 Prep and put all ingredients into a gallon-sized freezer bag. Label the bag with a date and cooking instructions, then put them in the freezer for up to 3 months. Then when you are ready to use them, thaw it in the refrigerator and simply pour the contents of the bag into the slow cooker, set it and get on with the rest of your day. It couldn't get easier. The following 10 recipes have been chosen for their simplicity; a great way to get started on freezer ahead meal planning. Pour in chicken broth and 6 cups of water. Cook on high for 4 hours or low for 8 hours. Shred chicken and add noodles. Continue to cook just long enough for the noodles to get soft (15-30 minutes depending on the setting). *rub dry spices onto brisket before placing in the freezer bag. Cook on low 8 hours. Cut across grain and drizzle with cooked sauce before serving. Cook on low for 8 hours. Shred chicken and return to slow cooker during the last 30 minutes of cooking. *Coat thighs in dry ingredients before placing in the freezer bag. Stir together contents of bag and frozen broccoli. Cook on low for 6 hours. Top with shredded cheese before serving. Cook on low 6-8 hours. Serve over noodles. **The following recipes call for ground beef. While you can slow cook with raw ground beef, it is highly recommended that you brown them prior to cooking. For a time-saving tip, purchase a large amount of ground beef and brown it all at once. Then separate into smaller bags to freeze for future use it in multiple freezer dishes. Pour in 3/4 cup water and stir. Cook on low for 7 hours. Stir in cheese and cilantro before serving. Stir ingredients. Cook on low for 6 hours. Serve over egg noodles. Alternatively, add egg noodles to slow cooker with 1/2 cup of water. Stir together and continue to cook until the noodles are soft. Cook bag ingredients on low 7 hours. In the last 30 minutes, mix up enough mashed potato to well cover the top of the dish, spread onto the cooked ingredients and continue to cook until the potatoes are warmed all the way through. If you liked these freezer-to-slow cooker recipes, be sure to SHARE it with your friends!